The standards proposed, reviewed and accepted by this process are targeted for use in data exchange and to facilitate interoperability. There is no demand on users of the standards to make any modifications to their internal data processing systems. If data and information is stored internally in a different form, the only impact should be to require a well-validated conversion on output of those data and information to a form that complies precisely with the accepted standard. All proposals should be reviewed with this in mind. The First Session of the IODE/JCOMM Forum on Oceanographic Data Management and Exchange Standards was held at the IOC Project Office for IODE (IODE-PO), Oostende, Belgium in January 2008. The meeting was organized because of the recognition that although there were mechanisms to help co-ordinate ocean data exchange, these had not resulted in the degree of agreement on a wide range of matters that are needed in order to allow the easy exchange and interoperability of collected data. The meeting discussed topics for which broad agreement seemed possible. It also established an internationally recognized process for submitting proposed standards and their acceptance by the ocean community. The ad hoc Session of the Joint JCOMM-IODE Steering Group for the Ocean Data Standards Pilot Project (SG-ODSPP) was convened in Oostende, Belgium in April, 2012 to discuss progress on standards. They recommended that the pilot project transition to a project with strong connections to a catalogue of best practices with the new name Ocean Data Standards and Best Practices (ODSBP) Project. A number of suggestions were made to improve the review process. These suggestions have been incorporated into this document. The standards that are produced by this process are intended primarily for the use of the marine meteorological and oceanographic community. If they have wider applicability, they may be submitted to appropriate international standards bodies, such as ISO. However, after recommendation, their use will be widely encouraged within IOC and WMO. It should be stressed that the adoption of a recommended standard does not imply that existing projects should necessarily replace their internal data and information (or âproceduresâ) by adopted standards. What is recommended is that such projects aim to make their procedures interoperable with adopted standards and that new projects utilize the adopted standards. Implementing accurate (carefully validated) conversions of existing data and information for interoperability purposes into adopted standards however also has costs, which could ultimately make it advantageous in some cases (e.g. where the standard completely captures the local procedures without loss of information) for projects to transition away from internal-only procedures towards standards-based procedures, to save ongoing conversion and validation costs. Not all proposals will attain the necessary support to be accepted as a global standard. In this case, it may be decided that the experience in the use of the proposed standard in a more limited domain, such as a project or in a national context, is still valuable and should be retained. The author(s) may then be invited to provide background documentation on which the proposal is based to be included in a catalogue of best practices. The purpose of the catalogue is to provide wider exposure of standards used in these limited domains that can serve as guides to others seeking to incorporate new ideas into their management of ocean data. 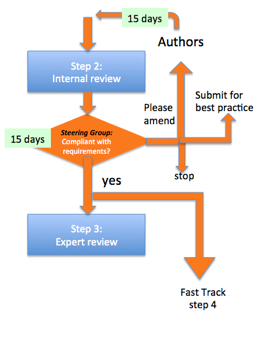 The overall process is presented in figure 1 (left) and is overseen by a Steering Group (SG). There are a number of steps in the process and a number of individuals and groups that have roles to play. These individuals and groups, and their roles and responsibilities are described here. Greater detail on these tasks and monitoring of the progress on a proposal are provided in the Appendix. Much of the activity related to submission and review of the standard will take place electronically. There may be face to face meetings of the team responsible for guiding submissions through the process, but approval is not tied to this meeting schedule. The acceptance of certain standards, such as lists of parameters, requires ongoing and long-term maintenance. The agency or group responsible for this will be determined during the course of the review and will be indicated in any draft recommendation prepared. A standard recommended by the review process is passed to the SG responsible for the Standards and Best Practices Process. The SG prepares the recommendation that is sent to parent bodies in IOC (through IODE) and WMO. These bodies will then decide if they accept the standard. A standard recommended by the review process has no international standing until accepted by parent bodies. The entire process is intended to be limited to a maximum of no more than 8 calendar months. Although the timing described in this document should result in a decision more quickly than this, there may be some time expended in identifying individuals to take part in the review. Polling of individuals and members/member states is an important part of the process. It is through such polling that it will be clear if there is wide spread support for a proposal. Polling will be conducted electronically, with a set period for response. If there is no response from those polled, this will be interpreted as unopposed. A proposal for presentation to the Ocean Data Standards and Best Practices (ODSBP) Process can be prepared by any group within IODE and JCOMM, and by any member state / member of IOC and WMO. In addition, other groups that have interests in the management of marine meteorological and oceanographic data may submit proposals for consideration. - Methods that can be used widely in the marine meteorological and oceanographic community. In order for a proposal to be considered, it must be prepared using the template provided on the ODSBP web site (http://www.oceandatastandards.org/index.php?option=com_content&view=article&id=38&Itemid=46). of the standards process web site (http://www.oceandatastandards.org) maintained by the IODE-PO and the review will start soon after. 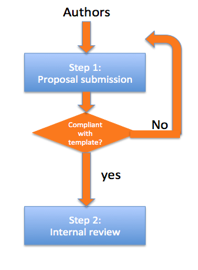 If a proposal is not compliant with the template then it will be returned to the author(s). The purpose of this step is to ensure that the proposal is complete and fully informative of what is being proposed. If information is lacking or the proposal is unclear, the author(s) will be contacted and provided with comments about what changes are deemed necessary. Some proposals may be considered as too limited in scope to achieve global acceptance. In spite of this, the proposal may have a strong basis in experience and support from a select group. The Internal review may decide that the documentation behind the proposal (the details of operations, processes, etc.) is nevertheless a valuable asset to be given wider exposure. In this event, the authors of the proposal will be invited to submit the background documentation to be included in the catalogue of best practices. By doing so, they will be exposing their practices to groups that are using the catalogue to improve their internal operations and may find such documentation helpful. (i) Is the purpose of the standard well defined and clear? (ii) Is their sufficient detail in the proposal to allow for an expert review? (iii) Is the proposal clearly written and complete? (iv) Are there any obvious weaknesses? (v) Is there another competing potential standard that has equal merit? (vi) Does this proposal address a pressing issue at this time? (vii) Can the standard be applied widely by the IOC and WMO member / member states? (viii) Is the information backing the proposal more suitable for the catalogue of best practices? (ix) Is the proposal suitable for a fast track approach? i. Does the proposal recommend the application of an existing international standard? ii. Is the proposed standard already a de facto standard with very broad use? iii. Are there reasons that justify a very rapid consideration of the proposal? Responses will be collated by the IODE-PO based on above-mentioned structure, and reviewed by the chair of the SG. For proposals that require amendments, author(s) will be given 15 calendar days to respond with a changed proposal (with a new version number assigned by the IODE-PO). If this deadline is not met, the submission will be dropped from further consideration. If met, the proposal will once again go to internal review and either receive support to proceed to step 3 or be dropped. The comments will be placed on the appropriate pages of the standards process web site maintained by the IODE-PO and associated with the proposal. The outcome of the review will be clearly indicated on the ODSBP web site. At any time, author(s) may inform the IODE-PO that a proposal is withdrawn. The IODE-PO will inform the SG, web pages updated to indicate the proposal is withdrawn on the appropriate date. The IODE-PO will retain the withdrawal notification from the author(s). The first action taken by the SG is to identify a âModeratorâ for the review. This person will be someone with sufficient familiarity with the subject of the proposal, but with no strong affiliation with the author(s). The role of the Moderator is to guide the review through the evaluation process, ensuring that all discussions reach a conclusion and consensus is reached if possible .The Moderator must identify and recruit members of the expert review team to examine the proposal. This should be done with the help of the SG. Members may be drawn from groups of IODE and JCOMM, from other international data systems or individuals with sufficient knowledge to contribute. The Moderator and the expert review team will work together to develop appropriate criteria for the review. These will be used to guide the discussions. The IODE-PO will establish an on-line forum for discussions of the expert review team. This forum will be password protected and discussions will not be made public. The review will be conducted as expeditiously as possible. During the course of the review, the expert review team may ask the Moderator to contact the author(s) to clarify aspects. These exchanges should be minimized since if they become too frequent, it is an indication that the proposal has not been written clearly enough. The Moderator should provide a brief monthly report to the SG. This report should summarize progress in the review and indicate what is left to do. 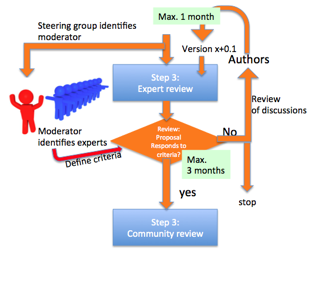 The Moderator may poll expert review team members at any time to determine if the proposal should pass to âProposedâ status (step 4). If the proposal achieves at least 75% support of respondents, the Moderator will recommend to the SG that the proposal status be changed to âProposedâ. ?The SG members will provide a response within 5 calendar days. At the end of 3 calendar months, if no decision has been reached by the expert review team, a poll of expert review team members will be taken. If there is sufficient support of members that favour the proposal the recommendation will go to the SG to move the proposal to âProposedâ status. If support is insufficient, the Moderator will write a review of the discussions and provide this to author(s). * another revision will be invited (with a new version number) and this will restart the Expert Review. * the proposal will be dropped. * the proposal will be dropped but author(s) are invited to provide background documentation for the catalogue of best practices (see the description of this in the text of step 2). At the end of this step, the IODE-PO will close the internal forum and archive the discussions. The Moderator will dissolve the expert review team used in the internal review. The IODE-PO will place the comments concerning the proposal on the appropriate pages of the standards process web site maintained by the IODE-PO and associated with the proposal. The outcome of the review will be clearly indicated. (i) It will update its web site for the proposed standard to indicate the changed status. (ii) It will open a public, on-line forum for discussion of the proposal. (iii) It will use methods such as Circular Letters, emails, notices on web pages and other communications means to notify NODCs and other meteorological/oceanographic data centers, international data management systems and teams, and other members of the public that the standard has been proposed. (iv) It will provide the login information and invite comments for a period of 3 calendar months. (v) It will invite interested parties to experiment with the proposed standard to assist in evaluating its utility. The Moderator, appointed for the Expert Review (step 3), will continue to guide the review during the public discussion. The Moderatorâs role is to foster discussion and evaluation and ensure that the discussions are clearly aware that the standard is targeted for ease of data exchange and interoperability and not to alter internal data systems of the agencies and projects. The Moderator should refrain from detailed explanations of the proposal since if this is required, it means the proposal is not clearly written or defined. The moderator should clearly spell out the criteria that should be used by the community to review the proposal. A poll to judge support for the proposal may be taken at any time, but will occur no earlier than 3 calendar months after the proposal achieved âProposedâ status. All IODE and JCOMM member / member states will be polled with one vote per member. Opinions of managers of International Data Systems and relevant Expert Teams may also be polled. For acceptance, the proposal requires 75% support of respondents. With acceptance of a proposal, the Moderator must consult with the author(s) to determine if there is a need for ongoing maintenance of the standard, such as would be the case for controlled vocabularies for example. If this is the case, the Moderator will consult with the author(s) of the proposal to identify who will be responsible for this task. The Moderator will recommend to the chair of the SG that the proposal pass to the âRecommendedâ step and, as appropriate, identify who will provide ongoing support. If the proposal does not achieve sufficient support, the Moderator will summarize the discussions of the forum, and provide a list of shortcomings identified. This will be provided to the SG. 1) to accept the Moderator's recommendation that the proposal be accepted. 2) that the proposal should be returned to the author(s), along with the comments and an invitation to resubmit a modified proposal (within 1 calendar month). Modifications suggested can include a change of the breadth treated by the proposal. 3) to cease further consideration of the proposal in which case the author(s) will be provided with the comments and decision. The SG may invite author(s) to provide background documentation for the catalogue of best practices (see the description of this in the text of step 2). 4) to suspend the proposal. Reasons for doing so may include that there has been insufficient testing performed, or that the proposal, though sound, needs more clarity. The Moderator will work with the author(s) to improve the description, or identify means to conduct further tests. 5) If a proposal is revised, the IODE-PO will assign an updated versions number and re-invite comments from the wide community. In no more than 3 calendar months, the revised proposal, with perhaps new results from testing, will again be put to a vote. If sufficient support is achieved, the proposal is recommended to the chair of the SG to pass to the âRecommendedâ stage, or is removed from the process. At the end of this step, the IODE-PO will close the public forum and archive the discussions. ?The SG will notify the author(s) of the outcome. The SG is responsible for preparing the draft recommendation to go to parent bodies for ratification of the standard. 1) use methods such as Circular Letters, emails, notices on web pages and other communications means to notify members states/members of IOC and JCOMM, international data managers and data management groups , and other members of the public that the standard has been recommended. 5) establish a registry where members of the data management community can indicate when and in what circumstances they have achieved compliance with the recommended standard. Note: there may occur cases when IOC decides to adopt a standard while WMO does not. In that case the standard will be an IOC standard but not a JCOMM standard. (ii) take steps to monitor use of accepted standards. JCOMM Expert Team on Data Management Practices (ETDMP) â The committee to which the SG reports results and passes draft recommendations resulting from a review of proposals of standards. Members may be asked to participate in the review. * will review a recommended standard and as appropriate forward a draft recommendation to IODE and DMPA. JCOMM Expert Team on Marine Climatology (ETMC) â Members may be asked to participate in the review. ETMC Chair â Notified of a submitted proposal, the Chair may wish to designate an expert to assist in the Expert Review. Expert â A member of the expert review team designated by the Moderator to provide a technical review of a submitted standard and provide comments, request clarification as necessary, suggest revisions, and make a recommendation as to whether the submitted standard should be moved to Community Review. * assist the Moderator in preparing the report to be provided to author(s) and the SG. * take steps to monitor use of accepted standards. * contacts the home agency of a potential Moderator to request time be allotted for this task. * Keeps a record of who is the Moderator, the members of the Expert Review Team, and responses from the Community Review. 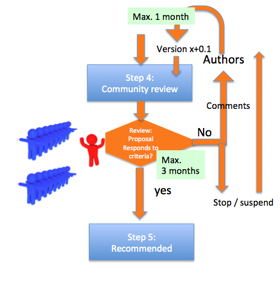 Author(s) â the person, group, project, or member who puts forward the submission for the ODSBP Review Process. Author(s) may be any individual, group within IODE and JCOMM, any member/member state of IOC and WMO, or other group that have interests in the management of marine meteorological and oceanographic data. * prepare draft recommendations for parent bodies of standards that have achieved international acceptance. 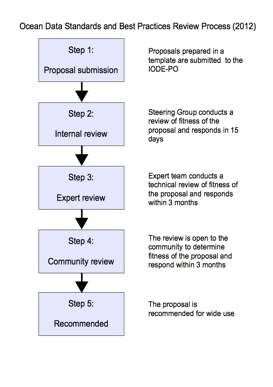 The IODE Project Office maintains web pages to indicate the progress of a proposal through the 5 step Review Process and the subsequent recommendation stage to parent bodies.